Top part of the ad now running in Facebook to promote 6/24 Conference. On the eve of a conference to rally support for America’s neglected veterans – many who have died waiting for the promised medical care from the Obama Department of Veterans Affairs, House Speaker John Beohner exclaimed last week “What the hell!” in exasperation that a year has gone by since the scandal story broke but only single person has been fired. 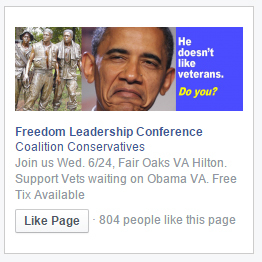 One of the ads which began running on Facebook to promote the 6/24 conference, thanks to the Sponsor donation of Concerned Veterans for America and Uniformed Services League, and two members of the Conference Leadership. 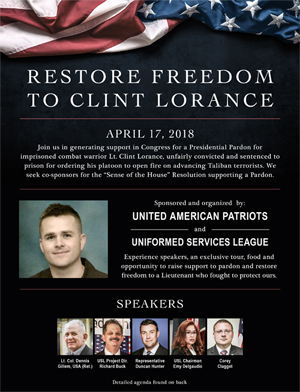 The open question is whether or not a groundswell of public support will materialize for the demands of Concerned Veterans for America (CVA) and the Uniformed Services League (USL) which are together sponsoring the Freedom Leadership Conference at the Hilton Gardens Inn in northern Virginia. Ads paid for in part by the two sponsor organizations have begun running on Facebook to promote the conference as shown above (and we thank two members of the conference leadership who have donated additional funds to pay for this new conference advertising). Those who wish to attend the conference must register in advance with 30 free tickets available and 15 tickets for the dinner with the keynote speakers and conference leaders discounted by $20 (first come first served, use code VIPFBCONF or follow this special link for the discount: DISCOUNT. The two pro-veterans organizations sponsoring the 6/24 Conference are part of a coalition which are outraged that the Department of Veterans Affairs has yet to fire employees for their involvement in the scandal with news reports detailing thousands who have suffered from waiting for promised medical care and some dying while waiting. Boehner demanded that the VA should take care of America’s neglected veterans as well as they take care of their own fellow government bureaucrats. Boehner is so frustrated because at least 110 (yes one HUNDRED and ten) VA facilities have been found to have kept secret wait lists to manipulate and cover up their actual, longer wait lists. At first there were claims by the Obama VA that 60 employees had been “fired” (the word they used) in the scandal but their number was later revised down to 14. But even the usually reliably liberal New York Times reported that documents given to Congress show only ONE person had been fired in the scandal. One person has retired (just like the criminal Louis Lerner at IRS after her law breaking escapades targeting conservatives). Others connected to the scandal got paid leave. In other words, those that the VA claim are being disciplined continue to collect government paychecks with none being subjected to any serious disciplinary action or being fired. Congressman Beohner likened the punishments to a “slap on the wrist” in his floor remarks, noting that a year after the scandal story broke, the number of veteran patients waiting more than 90 days has nearly doubled. The Obama VA’s problems are so deep that even with $16 billion in new funding authorized by the new GOP House and Senate majority over the next three years, it cannot even build a new hospital to help reduce the backlog. Boehner pointed to the half finished project in Denver that is already $1 billion over budget. “Only the (Obama) administration can change the culture from within, said Speaker Boehner. No response from the Obama White House or Obama VA to the concerns of the House Speaker. Dan Caldwell, who has served as a U.S. Marine in Iraq, speaks for Concerned Veterans for America, and Dr. Johnny L. Simpson, Jr., speaks for Uniformed Services League (scroll down for past articles about each of them). This entry was posted in Conference Announcements, conservative news. Bookmark the permalink.